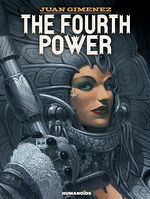 A powerful cocktail of science fiction, humor, and social criticism written and drawn by the artist of The Metabarons: Juan Gimenez! The odyssey of Exether Mega, a young military pilot caught up in an interplanetary conflict between humans — under the banner of the Planetary United States — and the Krommiums. After narrowly escaping an attack by an enemy patrol, Mega begins a perilous journey across enemy lines. 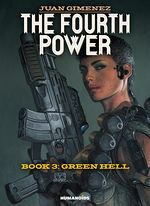 Through a series of encounters —with both friends and foes — Mega discovers she's at the center of a complex, secret experiment to create the ultimate weapon of war. 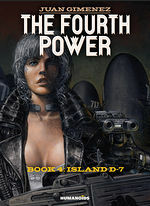 As further clues to her role, identity, and destiny are revealed to her, the powers that be ramp up their efforts to capture her. 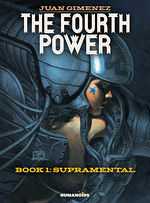 A spectacular and riveting space opera by the creator of Leo Roa and the illustrator of The Metabarons saga. [It's] it's not entirely unlike Jodorowsky's own work, both in terms of happy excess and spiritual yearning in a fallen, sleepy society. Spaceships… aliens… and that slightly-odd way of looking at science fiction the French do so well. If one seeks a feast for the eyes that does not tax the brain, that’s exactly what is to be had in this far-flung space opera.